This is a great side trip from Flagstaff, if you are there during the spring runoff. This waterfall is massive, about as wide as a football field is long and 190 feet high. The falls are fed by the Little Colorado River and are located on the Navajo Indian Reservation. The river carries a lot of silt, lending the falls the nickname, “Chocolate Waterfall.” It is magnificent in its glory, which is during the spring runoff and snow-melt, from late March through the end of April, generally. It is easy to find, but sits at the end of nearly ten miles of “washboard” road. You do not need a permit, as long as you stay in the immediate area of the falls. For hiking away from the immediate area, get a permit from the Navajo Visitor Center, 928-679-2303. Tribes are sovereign nations. If you stray onto their land, expect to be treated like a trespasser. There are a few small ramadas, which provide a place to sit and offer some shade from the sun or maybe enjoy a picnic. Check the weather forecast before you go. The dirt road, which isn’t much fun anyway, will be tougher to navigate when wet. There are a lot of pointy rocks on the track, so have plenty of tread on your tires. A four-wheel drive is not necessary, but a high-clearance vehicle is definitely a plus. A normal passenger car is subject to serious undercarriage damage. 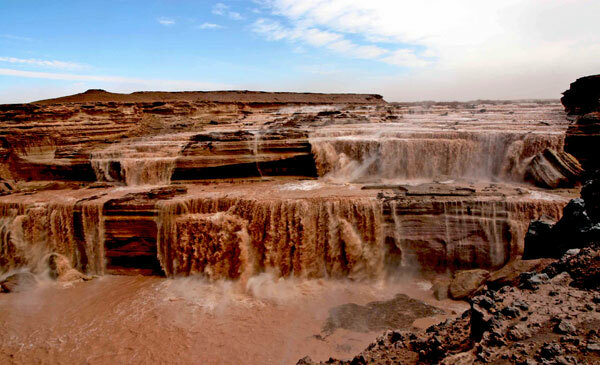 Also, the waterfall sits in the middle of a large, dusty plain.On windy days, expect to be pelted with sand. It isn’t dangerous, but don’t get too close to the edge of the canyon, because there are no guard rails. The falls only run 4 to 6 weeks a year, so it is a good idea to call the Navajo Visitor Center and check their status. From Flagstaff, it will take about an hour to reach. DIRECTIONS: From Flagstaff, take I-40 east fifteen miles to Exit 211, which is Winona. Drive 2.3 miles north to Leupp Road. Turn right and drive 20.3 miles to an unpaved road, Indian Road 6910. You will notice the mile posts change at the border of Navajo Reservation. The road is between mileposts 5 and 6. Turn left and drive 9.4 miles over very rough road to the unmarked turnoff on the left. If you come to the bank of the Little Colorado River, you missed the turnoff by two-tenths of a mile or so. Under no circumstances should you attempt to cross the river. Subscribe to our email newsletter for Arizona and Cactus League information. Arizona Tourism has been bringing you information about Arizona since 2001. We live in Arizona and have hiked many of the trails we write about, we've stayed in the hotels we feature and have lived the Arizona experience. Join us as we travel through Arizona to provide you the most complete information about vacationing in Arizona.